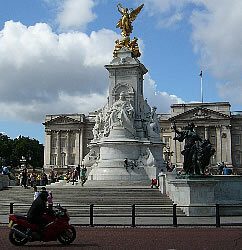 This page provides information about Buckingham Palace in London. Visitors may find it useful to refer to this map of the area. 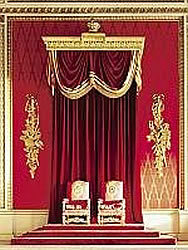 The 19 State Rooms are used for official occasions such as state banquets. 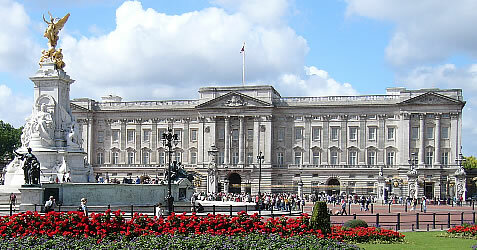 You can visit these during a two-month period each summer when the Queen is away on her annual holiday in Scotland, usually between late July and late September (this is known as the Summer Opening of the State Rooms or the Summer Opening of Buckingham Palace). It is advisable to buy a ticket in advance, as there is only a limited number of places available. Tickets allow entry at a certain time. You should try to arrive at least 10 minutes before this time at the waiting area on Buckingham Gate (map). There are security checks, and you may be asked to leave your bag (you will be given a ticket which you can use to collect your bag later). You can choose a free audio guide: these are available in English (adult), English (family version), French, German, Spanish, Italian, Japanese or Chinese. Visitors enter through the Ambassadors' Entrance and go up the Grand Staircase (overlooking the Grand Hall) to reach the first floor. 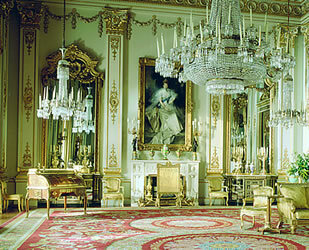 After passing through the small Guard Room you enter the main State Rooms: the Green Drawing Room, the Throne Room, the Picture Gallery, the Picture Gallery Lobby, the Silk Tapestry Room, the East Gallery, the Ball Supper Room, the Ballroom, the West Gallery, the State Dining Room, the Blue Drawing Room, the Music Room, and the White Drawing Room. After passing through the Ante-Room you go back down to the ground floor using the Ministers' Staircase. 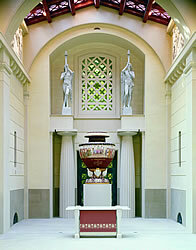 The route continues through the Marble Hall into the Bow Room. 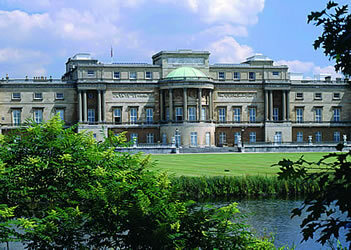 This leads out onto the garden terrace, where there is a shop selling exclusive Buckingham Palace souvenirs. 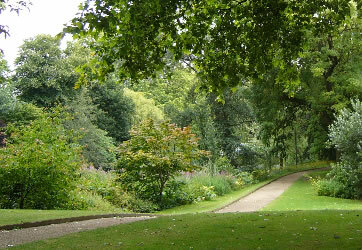 Finally you follow a path through the gardens (these cover an area of 30 acres in total, including a large lake) until you reach the exit (Stonemason's Gate), which is on the road called Grosvenor Place (map; the nearest Tube to here is Hyde Park Corner). 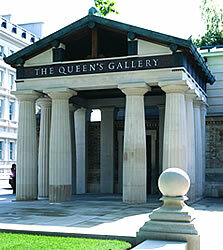 The entrance to the Queen's Gallery in London is located on Buckingham Palace Road (map). 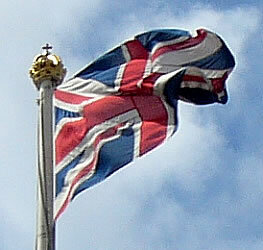 This is open throughout the year and displays items from the Royal Collection. 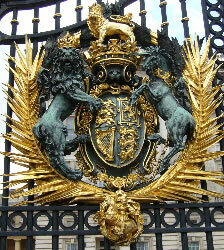 The Royal Mews is where the Queen's road transport is kept. 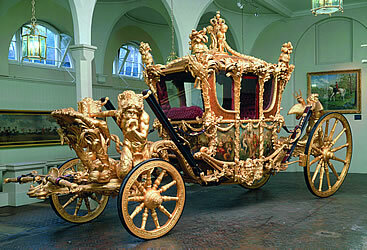 This includes the carriages which she uses during special ceremonies. It is also a working stable for the horses which are used. 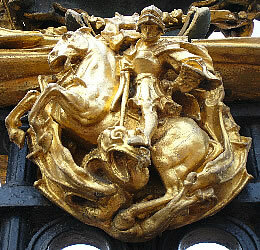 The entrance to the Royal Mews is on Buckingham Palace Road (map). 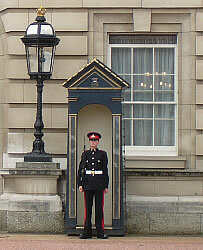 The soldiers who look after the Queen's security are known as the Household Guard. As well as performing ceremonial duties at the palace they are also fighting soldiers. It is daily from April to July and once every 2 days from August until March. Sometimes it is cancelled if it is raining very heavily. If you want to watch you should be there by about 11am. 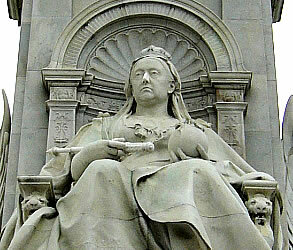 The best viewing places are on the steps of the Victoria Monument or next to the gates along the front of the palace. The ceremony starts at 11:30am and lasts about 40 minutes. 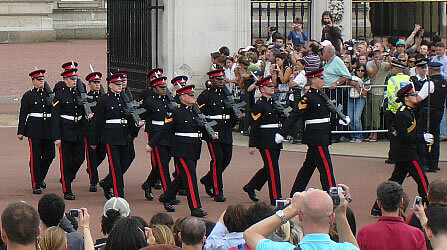 The marching is accompanied by a military band. After the ceremony the guards in front of the palace remain in position for two hours, switching their positions every 15 minutes. 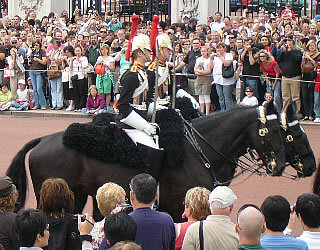 There is also a different ceremony for the change of the horse guard each day. 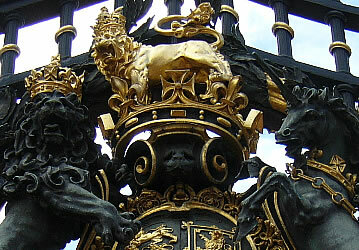 This starts at 11am Monday-Saturday (it is at 10am on Sundays) and is on Horse Guards Parade: map (you can get here from an entrance gate on Whitehall; nearest Tube: Westminster or Embankment). In total this traditional ceremony lasts about 30 minutes (there is no music). 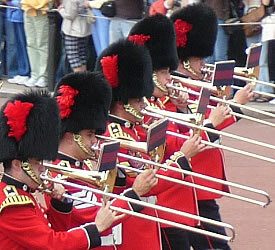 A similar changing of the guard ceremony takes place at Windsor Castle. 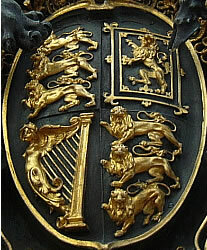 * Photos on this page which are marked with an asterisk have been provided by The Royal Collection, © 2007, Her Majesty Queen Elizabeth II.